Gray graduated in 2014 with a degree in mathematics and Spanish and a minor in actuarial science, while Ghirardo graduated in 2015 with a degree in applied and computational mathematics and statistics (ACMS) and a minor in actuarial science. 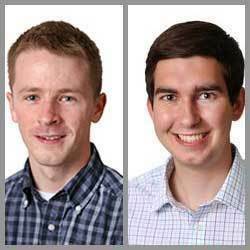 Both Gray and Ghirardo now work as analysts at consulting company 84.51, which is owned by Kroger and headquartered in Cincinnati, Ohio. The company specializes in data science and customer engagement. The growing data science industry takes big data and applies various models to it, in order to provide businesses with fact-based strategies and predict trends. At 84.51 analysts utilize data generated from Kroger customer loyalty cards to provide business strategies for the supermarket chain, on everything from determining aisle layouts to predicting the success of new services. Gray and Ghirardo discussed the role and responsibilities of analysts, gave students an insight into the types of projects they work on, and highlighted how the ACMS skills they acquired at Notre Dame are applied in such projects to turn big data into “actionable insights … [that] give business value.” The event was sponsored by the Delahanty Family Endowment for Excellence in Mathematics, the Department of Applied and Computational Mathematics and Statistics (ACMS), and the Actuarial Science Club. Originally published by Chontel Syfox at science.nd.edu on September 21, 2016.